Explanation: What's happening above that city? 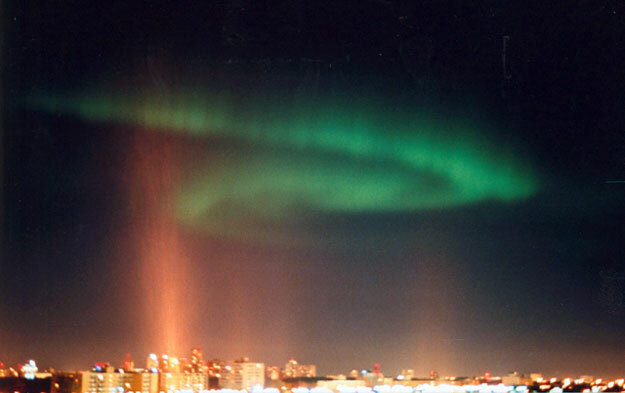 The city is Winnipeg, Canada, and the phenomenon is aurora. These past few months have been active ones for our Sun, producing several coronal mass ejections (CMEs) of particles that have swept past our Earth and caused many spectacular auroras. Specifically in this case, a CME that occurred on October 9 impacted the Earth on October 11 and 12, causing nearly 12 hours of auroras. The above-pictured aurora had to be very bright to be seen over the lights of Winnipeg, the city well below and in front of the cascading atmospheric airglow. Lights reflecting off of a slight haze cause an unrelated glow that emanates from some of the buildings.